The Frenchman got his first goal for the club as they easily brushed past the hapless reigning champions. WAYNE ROONEY WATCHED from the Manchester United bench as Paul Pogba inspired a 4-1 dismantling of champions Leicester City in Saturday’s Premier League clash at Old Trafford. The world’s most expensive player headed in his first goal for the club after Chris Smalling, Juan Mata and Marcus Rashford had all found the net in United’s first-half rout to help banish thoughts of back-to-back defeats to Manchester City and Watford. Jose Mourinho caused a stir by dropping out-of-sorts captain Rooney to the bench, though he stuck with the same 4-2-3-1 system, with Pogba – who has also faced criticism – excelling in a deeper role alongside Ander Herrera. Any concerns over a repeat of the turgid performance away to Watford were soon dispelled, as United’s pace and power pinned Leicester back before Smalling’s header gave them a deserved lead. The home side showed glimpses of flair play seldom seen under Louis van Gaal or David Moyes, and Mata made it 2-0 when he completed a fine team move on 37 minutes. A shell-shocked Leicester soon found themselves out of the game, as Rashford and the brilliant Pogba pounced from two corners in quick succession to give United a first four-goal half-time lead in a home league game since their 6-1 thrashing of Arsenal in February 2001. Demarai Gray’s sensational strike on 59 minutes gave Leicester the slenderest of lifelines, but United held firm to move temporarily to within three points of league leaders City, while the champions now have just seven points from six games. 4 - @ManUtd have scored four goals before half-time in a Premier League game for the first time since Dec 1st 2012 (4-3 v Reading). Rout. United were rewarded for a bright and busy start in the 22nd minute when Smalling rose unchallenged at the far post to head down and beyond former Red Devil Ron-Robert Zieler from Blind’s corner. 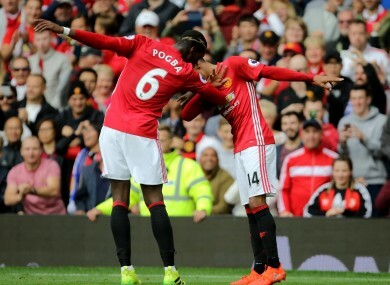 Rashford sliced high and wide when Ibrahimovic sent him clean through on goal, before the big Swede spun and volleyed over the crossbar after Pogba’s glorious chip, as United began to play with some long-awaited flair. And some more fine team play brought a second goal in the 37th minute. Pogba and Mata combined on the edge of the area, Jesse Lingard flicked the ball back into the latter’s path, and the Spaniard arrowed his shot beyond the right hand of Zieler. The home side had a third three minutes later. Blind caught Leicester cold with a quickly taken short corner to Mata, who had plenty of time to pick out Rashford to slide the ball home. Marcus Rashford has scored in three consecutive games for the first time in his Man Utd career. Old Trafford was in full voice by this point, but the noise reached deafening levels just two minutes later when Pogba powered Blind’s corner beyond Zieler to get off the mark for United. Ranieri – most likely with one eye on the Champions League clash with Porto on Tuesday – took off Riyad Mahrez and Jamie Vardy at half-time, and substitute Gray gave the travelling fans something to cheer when he cut in from the left 30 yards out and lashed an unstoppable shot beyond David de Gea and into the top corner. De Gea clawed another Gray effort away from the top corner before Rooney was given a 10-minute run-out in the closing stages, as United saw out a morale-boosting win that will raise plenty of questions over the future of the captain. Email “With Wayne Rooney dropped, Pogba and United impress in thumping Leicester win”. Feedback on “With Wayne Rooney dropped, Pogba and United impress in thumping Leicester win”.